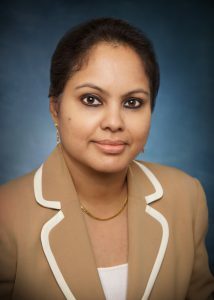 Suja Chandrasekaran is the Vice President of Enterprise Information Management (EIM) of Walmart’s Information Systems Division. She is responsible for establishing the overall strategic direction of Walmart’s expanding EIM function. Suja leads the development, implementation and ongoing operation of EIM products and services and is technical subject matter expert for the future direction of information management initiatives. Before joining Walmart in 2012, Suja was the Vice President and Global Chief Information Officer at The Timberland Company. She also worked at PepsiCo where she spent three years as Vice President and Chief Technology Officer for PepsiCo, North America with responsibilities across Frito-Lay, Pepsi Beverages, Quaker, Tropicana and Gatorade across all business units. Prior to her role at PepsiCo, Suja led business transformation at Nestle Americas. Suja earned her Bachelor’s degree in Electrical Engineering from the University of Madras in Madras, India. She has a Master’s degree in Business Systems from Monash University in Melbourne, Australia. She has also received a bachelor’s executive development education from the London Business School in London, England.